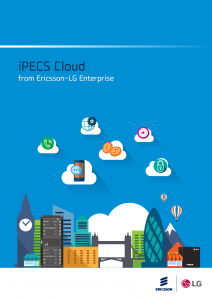 The innovative Ericsson-LG iPECS Cloud platform delivers a true evolution of the on premise IP-PBX delivering full PBX features and functionality, together with all the flexibility and benefits of cloud technology. …and so much more. Download the brochure or contact one of the team for more information. iPECS Cloud is tailored to deliver reliable and simple communications to your desktop from our highly secure and resilient data centres. This means we manage the phone system for you and you just use the handset, web portal or applications to access everything you need, when you need it. Because iPECS Cloud is designed to scale it suits all sizes of business whether you are have a single home office or multiple locations around the globe. With on-demand features and same-day provisioning you can add users or remove users quickly and easily. With our advanced feature packs you can completely tailor the user’s experience and provide a call centre solution, reception console and much more with a simple click. On-demand access to features and the ability to add or remove users means you have the flexibility to adapt to your business needs.